If your 9 to 5 requires you to be a desk jockey for most of the day, chances are you either need to hit the gym to work off that Subway sandwich you had for lunch – or worse yet, you don’t work it off at all (Jared would not be proud). Enter the Sit to Walkstation. 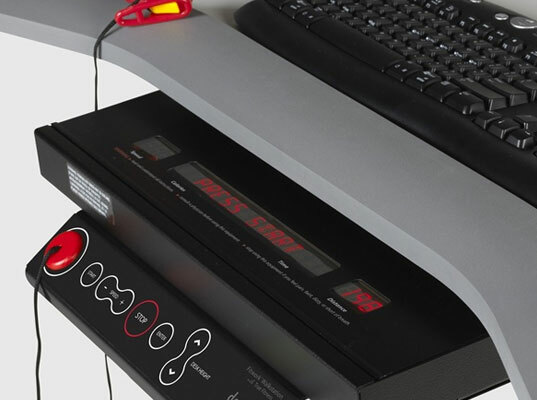 This desk/treadmill combo is the answer to every desk potato’s prayers! It allows you to sit, stand or even walk on a treadmill as you work so that your body can look as stacked as that last set of blueprints you handed in to your boss. Author’s Note: I am standing as I write this article and will be attempting to work the whole day today on my feet. 10:34AM: My legs are about to give out, but I am going to try my best to power through. 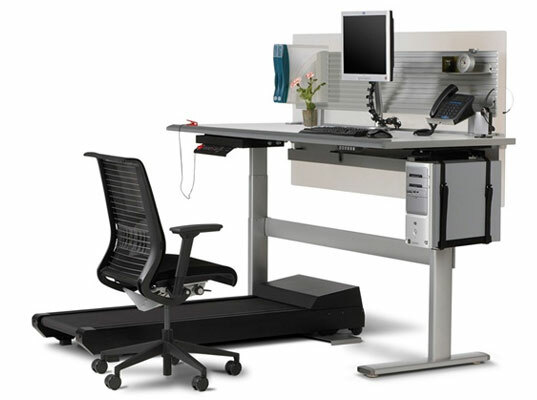 The Sit to Walkstation is an integrated treadmill and desk with room to fit an office chair and all of the files, folders, accessories that you would at a normal desk. In order to switch from sitting mode to standing or walking, all you have to do is push a button. And while we can’t say that the Sit to Walkstation is truly eco-friendly, it is definitely an example of design for health and it’s got steel components (steel is often a recycled material and a very recyclable material). So why stand or walk while working? Well, the answer may seem obvious – to burn calories and stay fit! – but if you aren’t convinced, read this article from the New York Times about how much of a difference having a standing desk can make. If you don’t do it for the weight-control benefits, do it for the positive effect it can have if you suffer from back pains associated with sitting in a chair for 8 hours. At $4,599, not everyone will be able to afford the Walkstation. If you can, more power to you, but if you can’t why not just ask your boss if you can work at a more elevated surface and stand instead? 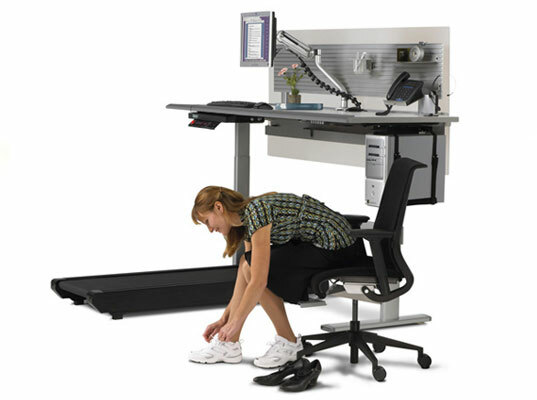 Or if you work at home and are really brave, you can try jerryrigging your own desk treadmill – but please exercise caution as you exercise! Try a Standing Fit unit; www.standingfit.com. Best to choose to stand or sit. feio - you clearly didn\'t read the linked NYTimes article. There is plenty of evidence to suggest that working out is not enough. That sitting for 5-8 hours a day COUNTERACTS the exercise you get by spending an hour or two at the gym. What makes these work and exercise so effective is that you don't even know your working out. But I have used a similar type (FitDesk.net) for 8 months and feel and look great. I am a believer in this product. If your 9 to 5 requires you to be a desk jockey for most of the day, chances are you either need to hit the gym to work off that Subway sandwich you had for lunch - or worse yet, you don't work it off at all (Jared would not be proud). Enter the Sit to Walkstation. 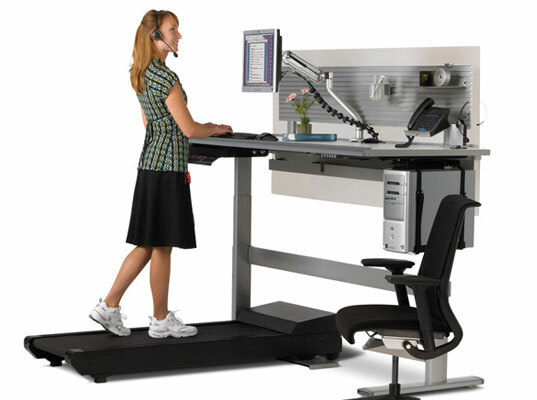 This desk/treadmill combo is the answer to every desk potato's prayers! It allows you to sit, stand or even walk on a treadmill as you work so that your body can look as stacked as that last set of blueprints you handed in to your boss.